Someday soon, you’ll need a routine medical test, perhaps an ultrasound or a mammogram, and you’ll obviously want the best. But the quality of health care tests and procedures can vary a lot depending on the doctor or hospital, and it’s not easy for patients to find information about quality. Still, we’re all supposed to be choosing our care more carefully these days. So when I got a scribbled note from my doctor saying that it was time for a colonoscopy, I set out to find the best one in Boston. I used to think a colonscopy is a colonoscopy, just one of those tests we have to get when we hit middle age. Then I met James Tracey, a gastroenterologist (GI) who does more than a thousand colonoscopies a year. He starts telling me about this running competition he has with other GI docs, one in particular at Hawthorn Medical Associates in North Dartmouth. It’s about who has the highest rate for finding polyps in patients during a colonoscopy. 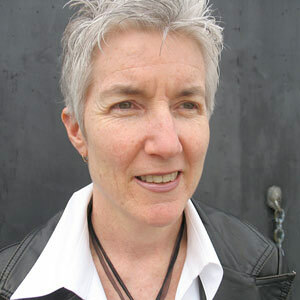 Tracey tells me some doctors in his practice find polyps in twice as many patients as others. Hold on, I think, this seems pretty important. I’m getting this not-so-pleasant test to look for adenomas, those polyps that can develop into colon cancer. So I ask Tracey, why is there such a big difference? He reminds me the colon is a five- to six-foot-long tube packed into the abdomen. My takeaway is that some doctors look more closely for polyps than others. And, of course, patients play a big role here. If we don’t follow the prep instructions, such as fasting, and come in for this test with a clean colon, the doctor is not going to have a clear view of potential problems. OK, enough description. So I make a list, based on conversations with doctors, of ways that one colonoscopy can be better than another. I email the list to some large hospitals and physician groups in Greater Boston and ask them how they measure up. For now, if you need a colonoscopy, be sure you ask at least one question: How often does your doctor find adenomas, the polyps that can develop into cancer? That answer is important. 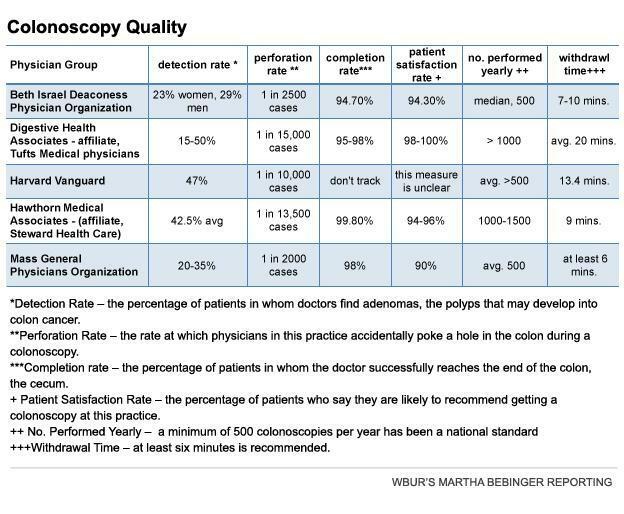 If you really want to find the best “value” colonoscopy, try comparing the quality chart [top] and the cost chart... Both are rough. The quality information has not been cleaned up or adjusted for the sickness of patients. 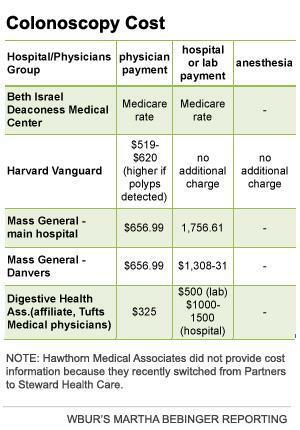 And on the cost chart, some of the prices you see are based on what my insurer, Blue Cross, would pay, and some aren’t. This isn’t close to what we patients need to make smart choices, but it’s a start. This program aired on January 10, 2013. The audio for this program is not available.